For as long as I can remember, I’ve loved eating anything made with flour – bread, muffins, cakes, pasta, just to name a few. Trying to cut down on carbs makes me extremely grumpy, so I’ve more or less given up on the whole low-carb diet thing, despite having been told by many people that carbs (and not fat) are actually what make you gain weight. I’m trying to control my cake and muffin cravings though by trying to eat only what I bake myself. 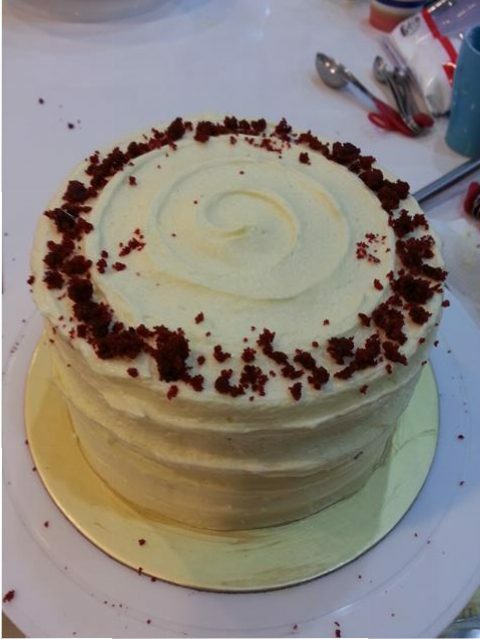 To that end, I’ve been baking fairly regularly on the weekends when I’m at home, with decidedly mixed results, but I recently tried something new – a hands-on Red Velvet Cake baking class at Baker’s Brew Studio! I recall having been to a few baking classes in the past but they were demo-type classes, so this was something different. And it was FUN! They conduct the classes by doing a demo first of one step (e.g. preparing the batter) and having us then do that. 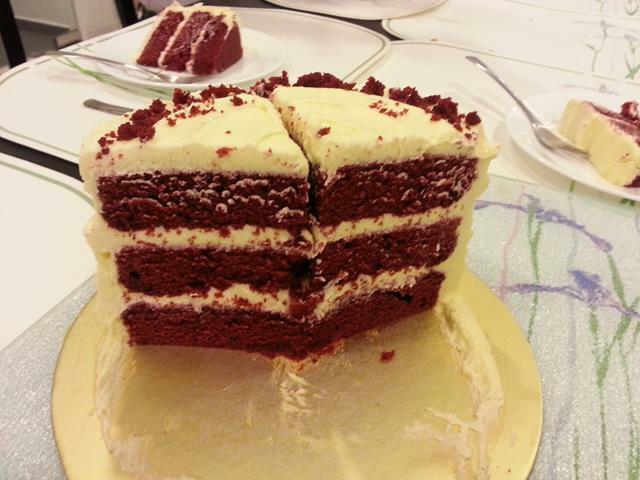 Then, while we waited for our cake to bake, we had a demo of how to prepare the frosting, and so on. 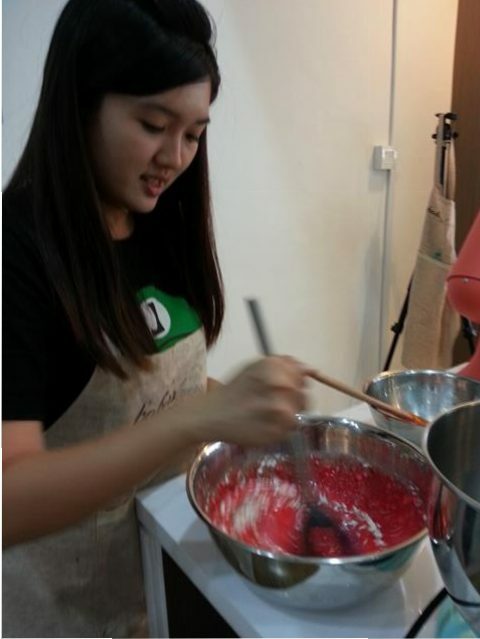 She did the dry ingredients (flour, cocoa powder, sugar etc.) 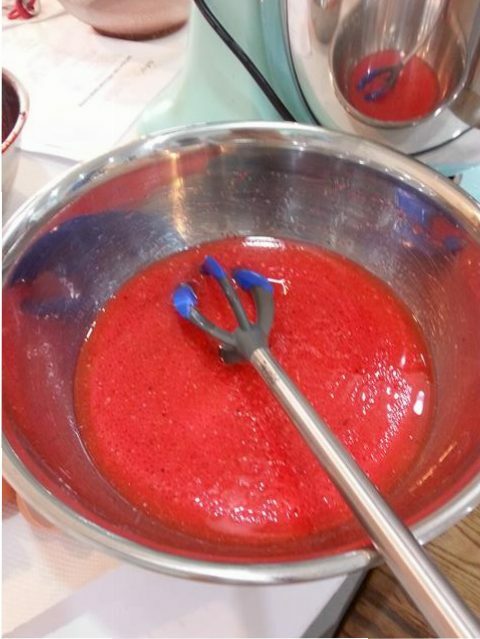 and I did the wet ingredients (buttermilk, eggs, vegetable oil, red food colouring etc.) 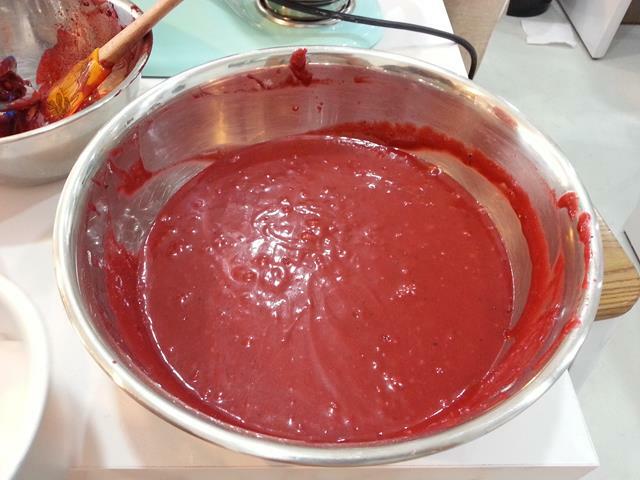 – the picture above is what my wet ingredients mixture looked like once I was done. 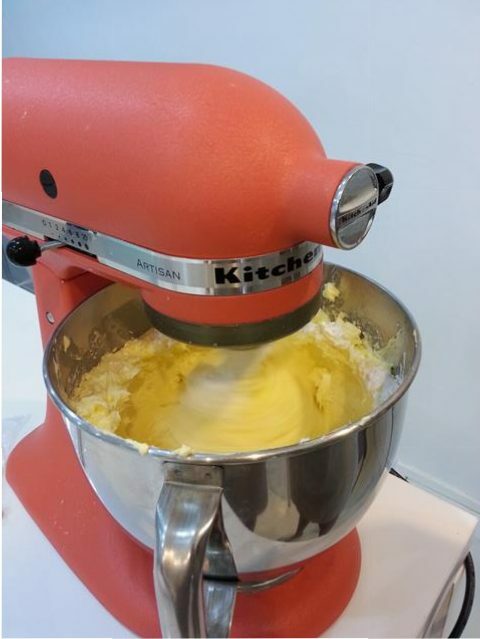 I was surprised to learn from Heidi (our instructor) that: (i) butter is actually healthier than oil; and (ii) baked goods with oil keep moist better when you refrigerate them because the butter will harden once it gets cold again. (ii) makes sense when you think about it. I’m not sure why (i) is the case, but I’ll take her word for it – at least until I get around to researching it. The wet ingredients weren’t fully mixed together but according to Heidi that was fine as they would continue to mix once you put in the dry ingredients. 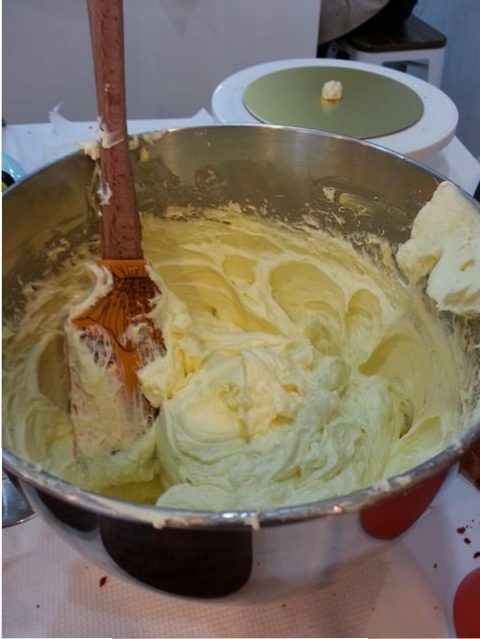 Almost smooth batter with tiny lumps. Heidi was walking around to check on us and it’s a good thing she did, or I would have left the batter severely undermixed. 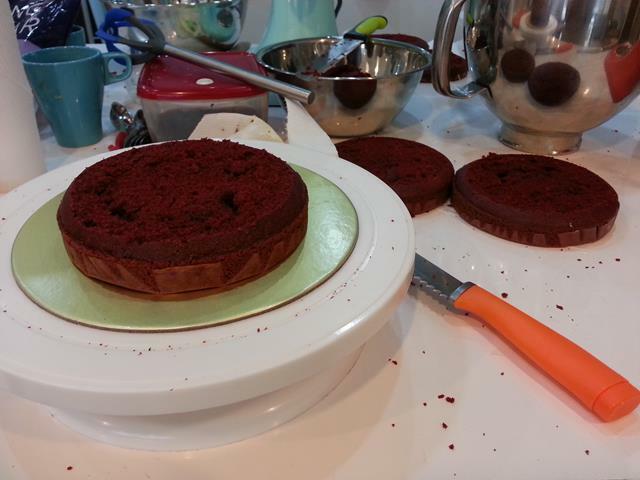 The batter was then divided into six tins (to make a 3-layer cake for each of us) and put into the oven. This is mainly composed of cream cheese, butter and icing sugar which was mixed until it turned the desired shade of white-yellow. Probably the most exciting part of this was getting to use a KitchenAid mixer for the first time! These things are insanely expensive and my own mixer costs less than 1/5 of what these cost, but they’re reputedly the gold standard of mixers. That said, I have no real way of telling whether the mixer lived up to its reputation, until I try it at home with my humble Phillips mixer. It is very sturdy though, and it has more speeds. 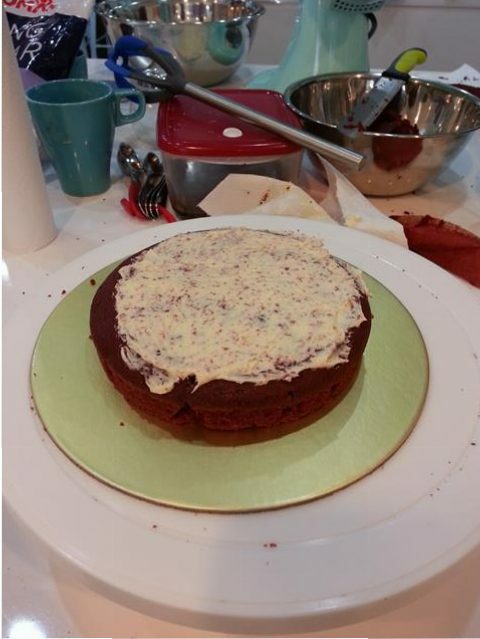 And then it was time for the most challenging step of all (in my opinion) – decorating the cake! This rather thick coat of frosting is my attempt at a crumb coat, where you coat the exposed surface of crumbs to prevent them getting all over your frosting. With this cake, it would be fairly obvious when the frosting is “contaminated” with cake crumbs. Sadly, I wasn’t entirely successful and still ended up with a few red dots in the cream. As someone who has always sucked spectacularly at art and has no artistic talent whatsoever, it blows me away that I was able to make a cake this elaborate (by my standards) with a little help from the staff at Baker’s Brew, who were walking around to make sure nobody screwed up their cake too badly. 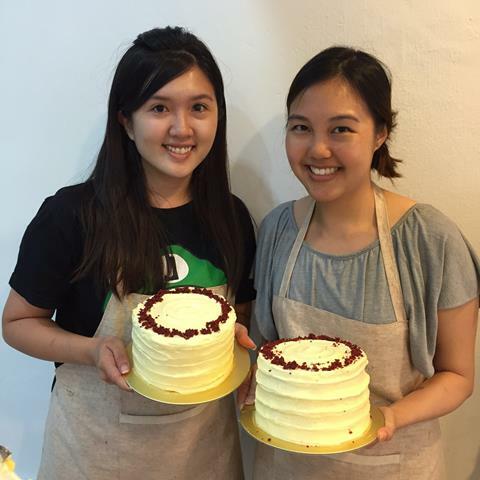 In fact, I think everyone’s cakes turned out really nice. That’s a pretty high success rate. I definitely wouldn’t have been able to do this if I had done my usual learning by trial-and-error at home.